Online meal kit delivery services comprise of new innovative means of delivering food while, at the same time, affording the customer more convenient ways to preparing meals at home. With 27 percent of internet users purchasing restaurant and meal kits through the internet in 2016, online meal delivery services are designed to eliminate the hassles of meal planning and grocery shopping. It has been touted as a possible solution to the perennial problem of “What’s for dinner?” The fast-growing niche market of online meal kit delivery services has continued to expand ever since its introduction in 2012. Revenue is expected to grow to over ten billion U.S. dollars in 2020, from one billion in 2015. In providing the means for people to cook restaurant-quality meals at home without having to visit a grocery store, the market for online meal kit delivery services now consists of a lot of competing providers. Top competitors within the industry include: Blue Apron, HelloFresh, Plated, Home Chef and Munchery. 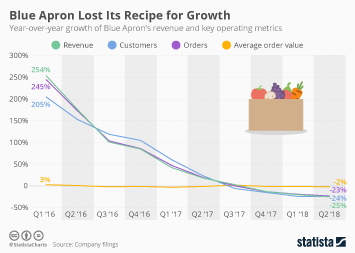 As of 2016, Blue Apron was rated as the most popular service provider worldwide with over 70 percent of the entire market share, and 795 million dollars in revenue. Customers spent an average of over 500 U.S. dollars within six months of subscribing to Blue Apron. HelloFresh comes after Blue Apron in popularity with a total of around 90 million servings delivered worldwide in 2016 and approximately 857,000 active subscribers worldwide as of 2016. Although Hello Fresh experienced over 300 percent growth in net revenue in 2015, by 2016 the growth rate had shrunk down to about 96 percent, a sign that consumer interest in meal delivery kits had diminished considerably over the course of a year. In 2016, the average price per meal kit for Blue Apron was 9.99 U.S. dollars and 11.5 U.S. dollars for HelloFresh. Service-types also vary from provider to provider although the basics are quite similar. You sign up using an online portal, a monthly fee relative to membership type is incurred (usually a one-to-two-dinner-per-week membership) and, with the aid of picture menus with photos of finished dishes, customers can place an order. The meal kit is then delivered in temperature-controlled boxes filled with fresh pre-measured ingredients to the customers’ doorstep accompanied by step-by-step recipe instructions to help guide through assembling and cooking of chef-quality home-made meals in less than an hour. New recipes are often featured on a weekly basis. Apart from fostering the habit of cooking at home as an alternative to fast-food meals on the run, most service providers also offer family-friendly and specialty diet options with plans for organic, vegetarian and vegan meals. A major drawback of online meal kits is the high cost of its products, as can be observed in the steep drop in the number of returning customers. A 2016 survey of U.S. consumers found that only two percent of respondents had used a meal kit delivery service and were satisfied with their experience; while 54 percent of respondents reported never using one and having no interest at all, evidence that meal kit delivery services still have many hurdles to overcome in order to gain mainstream popularity. Topic: Online food delivery services in the U.S.